Churchill Manitoba offers one of the most unique opportunities for scientific research in the world. 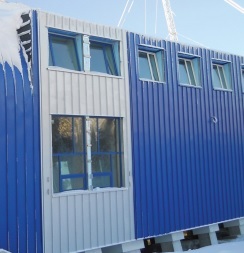 Until recently, scientists housed at the Churchill Northern Studies Centre stayed in a gray, shed-like building with few windows and no visual appeal. “It was an aging facility purchased from the federal government in the ‘80s,” said LeeAnn Fishback, scientific coordinator for the studies centre. Construction began on a new 2,600m2 (28,000 sq. ft.) facility in July 2010 and it was completed in May 2011. The East side wall of the Centre is a SW250 Profile solar wall supplied by NRG Management, coloured QC 6084 Navy Blue and it is used for passive ventilation heating. 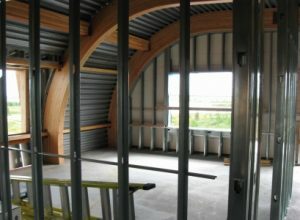 Steel was also used for the protective anti-bear bars on the windows.